Flights are now possible from Basel, Helsinki, Stockholm, Gothenburg, Copenhagen, Aalborg, Billund directly to the Canary Island La Palma! Immediatamente I voli sono possibili a Helsinki, Stoccolma, Gothenburg, Copenhagen, Aalborg, Billund, Basel direttamente sull'isola canaria di La Palma! Immédiatement Vols sont possibles à Helsinki, Stockholm, Gothenburg, Copenhague, Aalborg, BASEL, Billund directement sur l'île canarienne de La Palma! Välittömästi Lennot ovat mahdollisia Helsingissä, Tukholmassa, Göteborgissa, Kööpenhaminassa, Aalborg, Basel, Billund suoraan Kanariansaarten La Palma! Onmiddellijk Vluchten to Helsinki, Stockholm, Gothenburg, Copenhagen, Aalborg, Basel, Billund right on Canary Island La Palma! Omedelbart flyg är möjliga i Helsinki, Stockholm, Gothenburg, Köpenhamn, Aalborg, Billund directly på kanarieön La Palma! Umiddelbart Fly he mulige Helsinki, Stockholm, Gøteborg, København, Aalborg, Basel, Billund direct på den kanariske ø La Palma! Umiddelbart Flyreiser he mulig i Helsinki, Stockholm, Gøteborg, København, Aalborg, Basel, Billund direct på kanariøya La Palma! The finca in Palmero-style wooden interior roof on the sunny west side of the island is located in a quiet secluded location on a 10th 000 sqm of land and offers a breathtaking view of the Atlantic. The 8.4 x 4.2 m pool is has a 1.5 m high cover that can be opened completely, or you can swim in cold weather or abernds. Pool headlights in the pool! The pool is heated. In the salon the 1 fireplace, satellite TV and stereo, DVD, VHS tapes, books, games. All rooms are heated. The bathrooms are equipped with toilet and bidet, 2 sinks, heated floors. The house has a glassed-in porch, 4 terraces (Atlantic, Mountain, Garden View) with garden furniture and parasols. In the garden all year round blooming flowers, almond & fig trees grow. A barbecue is available. Lawns and well-kept subtropical flower garden with walking paths comprise about 2 200 square meters of the site. Infants (0-3) are available free on request cot, highchair and bathtub. 1. Guided walks in the nature reserve 'Caldera' on La Palma are highly recommended. You have to be fit for this company, since large differences in height to be overcome.
. 2 A boat trip along the west coast from Puerto Tazacorte - with the possibility of dolphins, whales, sea turtles to see and bathe himself - takes between 3 and 5 hours, with little swell a pleasure.
. 3 The volcanoes in the south of the island are worth a day trip.
. 4 The capital 'Santa Cruz de La Palma' visit is best in the morning, as it then approaching most alive.
. 5 A North tour around the island, visiting the Guanchen- drawings (Zarza Gorge) and the highest mountain 'Roche de la Muchachas' with the astrophysical observation stations and a fantastic view should be planned as a day trip. Calm - Relaxation - Sports: The villa offers enough space to retreat - 2 living rooms, 2 lawns, 4 terraces - rest and relaxation is experienced. Descents to bays on the Atlantic, visiting the sea salt - salt mines (south), paragliding, guided mountain tours, capital St. Cruz de la Palma, Guanche caves of the natives; Mountain biking tours, horseback riding, snorkeling, swimming, surfing, diving, tennis, volcanoes in the south, walks (also from the house) into the nature reserve of the caldera Taburiente, wine tasting in winery Bodegas! We provide on request Deep Sea Fishing - Tours. You can go from the house walks or hiking in the mountains. To hidden beaches are safe, but strenuous trips to the west and north coasts possible - walk between the remote northern villages are wonderful. - About Gardening on the 3rd 000 m² garden - if you can not stand the quiet - enjoy the owner, please but the teacher, Mrs Nebl, who lives on the premises and works, accept as a boss. After all the Canary Islands, you can reach by ferry or airplane; since 2008 with a high-speed ferry to Tenerife. (1) El Hierro is reachable only on Friday and Sunday by plane - but stand 20103 worth for a trip very, if you have the diverse La Palma possibilities exhausted. (2) The Loro Parque in Tenerife is well worth seeing and excited children and adults. Among other things, there is the largest collection of parrots in the world. He shows not only tourist attractions but is also a recognized zoological research institute. (3) 2002, the 'Pacifico' set up in Tenerife, an Arctic - particularly endangered Humboldt penguin station. (4) In Gran Canaria attract the white sand dunes of Las Palomas (minimum trip for 2 days). We found Villa Landhaus Tijarafe to be a comfortable, well equipped place for our first visit to La Palma. The owner is in the process of installing a pool which was not ready for use. This would have been a bonus as the weather at the end of January was certainly hot enough for a swim. The gardens were delightful with variety of different places to sit either in full sun or dappled shade. All the television programs were in German with just a couple of English speaking news channels. The housekeeper told us that we could receive BBC 1 but this was not so. We phoned to ask if she could come and program at least one English speaking channel but she refused suggesting that we ask the gardener who lived in the villa grounds. The gardener did try but had no idea how to program the channels. We do think that if this villa is being offered to other nationalities, there should be appropriate channels. Nothing had prepared us for the horrendous drive from the road to the villa so although the villa was lovely it is unfortunately not for us. Die Gäste haben uns schon während ihres Aufenthaltes berichtet, dass sie Schwierigkeiten beim Befahren unserer Privatstraße zur Ferienvilla hatten. Sie haben aber gleichzeitig auch berichtet, dass Sie ein tiefergelegtes Auto gemietet hatten, mit dem das Fahren um ansteigende Kurven Probleme bereitete. 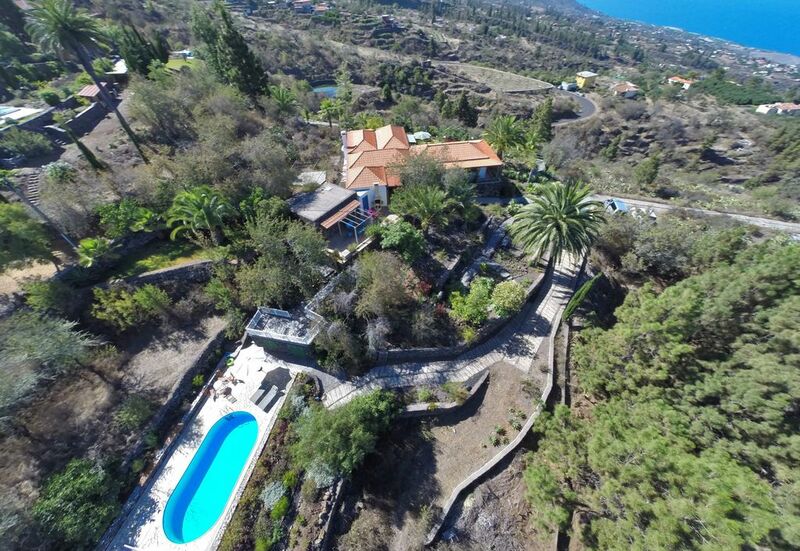 Alle unsere Gäste werden darauf hingewiesen, das La Palma gebirgig ist und das unsere Villa am Berghang liegt. Die Privatstraße ist steil, aber dort fahren auch Laster, wenn etwas angeliefert werden muss UND sie garantiert, dass die Umgebung ruhig ist und kein Durchgangsverkehr diese Ruhe stört! Ja, dem Pool fehlen noch die Fliesen für die Umrandung, die Luft-Wärmepumpe für die Beheizung und die Abdeckung, damit Energie gespart werden kann und kein Schmutz in den 4,2 x 8,4 m Pool gerät. Er wird ab Mai nutzbar sein und dann bei jedem Wetter, denn unter der Abdeckung lässt sich auch gut schwimmen. Guests have us already reported during their stay, they had difficulty driving our private road to the villa. But they have also reported at the same time that they had rented a lowered car, what caused problems by driving through rising curves. All our guests will be noted that La Palma is mountainous and our villa is situated on the mountainside. The private road is steep but there also drive lorries when something has to be delivered AND it guarantees that the environment is quiet and no through traffic disturbs this rest! Yes, the pool still needs the tiles for the border, the air heat pump for heating and the cover so that energy can be saved and no dirt comes inside the 4.2 x 8.4 m device pool. The pool will be available beginning in May and then in any weather because under the cover guests can also swim well. This is the best holiday villa we have ever rented. The location is superb, the garden is full of flowers, even in February, and the house is luxurious and comfortable at the same time. There are good sofa's, vast wardrobes, lights to read by, plenty of garden furniture and every kitchen utensil you can imagine. Stunning scenery is everywhere: the dragon tree and flowering almond-lined valleys of Las Tricias to the North, the spectacular Caldera to the East, sunny Tazacorte to the South. We hope to come again! Thank you to Marja and her Family. Please tell it to your frieinds and relatives. My wife and I have spent two holidays in the villa (March and September 2014) and we highly recommend this spacious and well-equipped property which is maintained to a high standard. The villa is light and airy and is set in an imaginatively landscaped garden of many levels, with stunning panoramic views over the west coast, ideally placed for sunsets. The scenery is dramatic and there are many opportunities for outdoor activities, including walks of varying length up to the caldera or down to the coast. The beach at Tazacorte is a short drive away and local shops and amenities are also conveniently close (by car). After a day's activities the villa is a peaceful and relaxing home to return to. Thank you for your kind recommendation. Die Aussicht von diesem Ferienhaus ist grandios. Wir haben den Blick auf den Atlantik jeden Tag genossen. Genuss bot auch das Schwimmbad, in dem wir gerne auch abends mit geschlossener Haube geschwommen sind. Im Garten blühten überall auch im "Winter" Pflanzen und die Ruhe und genauso die warme Sonne trugen dazu bei, dass wir uns schnell erholt haben - es hat aber auch mal geregnet. Macht nix, das Haus ist gemütlich, weil man sich in zwei Wohnzimmern immer einen Platz zum Lesen suchen konnte. Kochen in der Finca hat uns Spaß gemacht, weil halt viele kleine Küchenutensilien da sind, obwohl wir sie manchmal auch suchen mussten - und gefunden haben. - Insgesamt: Urlaub war richtig gut! alles wie im Internet angegeben - prima! Die Versprechungen und Informationen von fewo-direkt und vom Vermieter entsprechen der der Wirklichkeit. Recht viel Platz im Gebäude,Villa, Garten und Schwimmbad sind gepflegt, Holz für den Innenkamin war reichlich vorhanden; die Kontakte bei der Schlüsselübergabe und bei Nachfragen waren sehr freundlich, gutes Preis- und Leistungsverhältnis. So soll es sein, danke - kommen Sie wieder! The Canary island of La Palma has a lot of nature, mild year-round temperatures and tranquility. The typical palm innovative place Tijarafe lies on the sunny west side of the island with stunning Atlantic panoramic view and is an ideal starting point for hikes. In the village there is an old to SIGHTSEEING Handwerkerhaus (Casa de Maestro), a little further north good local wine is made (Vega Norte). From Puerto Tazacorte from are boat trips to the island part of coast (dolphins, sea turtles, sometimes irrigation channels, bays, swimming) and fishing trips sea possible. In the south volcanoes (last eruption 1971) and a sea salt saline - with nature trail and good restaurant - visit; the north offers untouched nature and the Roque de los Muchachos (over 2400 m) with many observatories and a magnificent panoramic view over La Palma and the islands of Tenerife and El Hierro. In this or another Northern Tour can also be the rock carvings (petroglyphs) of Benoahores, a Guanche group admire in Zarza Canyon. There exists also a small museum. The Villa Country House Tijarafe lies solely on the outskirts of the village Tijarafe in a quiet location on a hill (no through traffic, private road to the villa). - Relaxing recreation is guaranteed: in a comfortable villa surrounded by terraces with garden furniture, sun loungers and parasols, in the subtropical flower garden and two lawns in a harmonious landscape. - Our guests Margrit and Eduard from Sassnitz listed in the guestbook: 'Holiday Accommodation to our gusto, Luxury House, spacious and really comfortable'. Other Activities: Hiking, mountain tours, boat trips and swimming in the new Steranpromenade of Puerto Naos or swim, eat, stroll on the beach of Puerto Tazzacorte - boat trips from Puerto Tazzacorte and from Santa Cruz. Golf: Golf can be played excellently in Tenerife and Gran Canaria. You can fly from morning Santa Cruz de la Palma to one of the islands and back in the evening - Attention weekends: Many Palmeros want to spend the weekend at home and the planes fill up quickly, so book early also. Registrations in the golf clubs are at an early stage is necessary because such. be allowed T. limited number of guests. Some equipment can be rented, inquiries are necessary. We can help you with further information and book on request for you. Ski: In La Palma falls only in the alpine mountain snow parts; Slopes there are not - but a snowball fight in January may be possible! But guided mountain tours are offered.